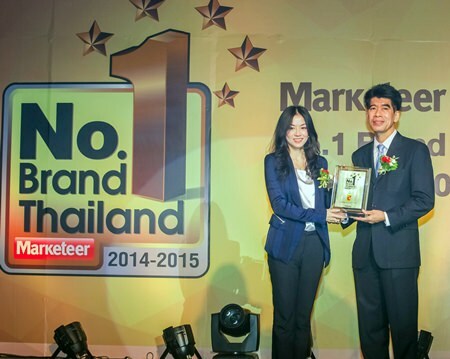 Warunee Kitjaroenpoonsin, Director of Corporate Affairs, Big C Supercenter PCL, received “Thailand’s Most Favorite Hypermarket”’ award from Wichchakorn Chandrasiri, Senior Director of the Department of International Trade Promotion, after having been selected as the most popular hypermarket for the 4th consecutive year in the “Marketeer No. 1 Brand Thailand 2014-2015” survey. Marketeer Magazine, in cooperation with Video Research International (Thailand) Limited, has conducted a customer brand satisfaction survey throughout Thailand, in which 4,000 males and females, aged 12-59 years old, were randomly selected from every part of Thailand to participate in the survey.